The momentum of the cruise sector at the Port of New Orleans has the Crescent City positioned to make riverine cruise history. The sixth-largest cruise port in the U.S. will welcome the first modern riverboat in the U.S. this fall, the American Cruise Lines American Song. American Songis set to make its inaugural cruise Oct. 6, 2018, on the Mississippi River from New Orleans during the city’s tricentennial year, according to American Cruise Lines, the company that operates the ship. American Songwill cruise a full schedule of 8-day Lower Mississippi River cruises throughout the remainder of 2018 before repositioning to the West Coast in 2019. American Song’ssister ship, American Harmony,the second modern riverboat in the series, will take over on the Mississippi River in 2019 joining two of American’s Victorian-style paddlewheelers, Queen of the Mississippiand America. 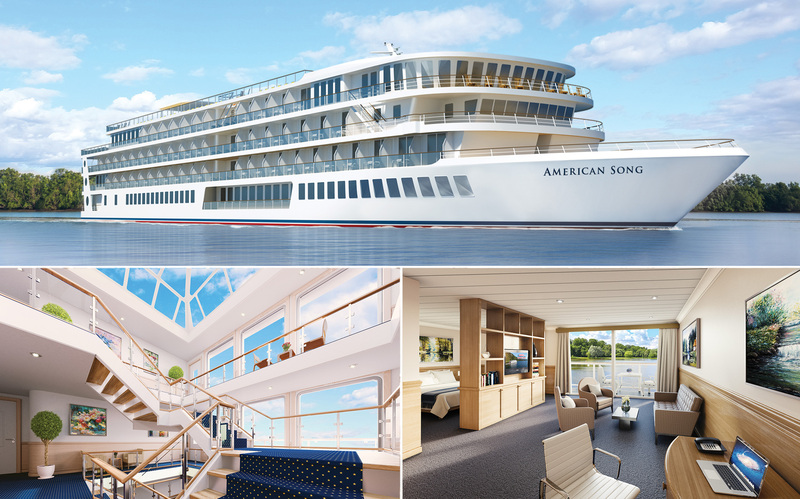 American Cruise Lines describes American Songas the flagship in the new series of contemporary riverboats and will introduce many pioneering innovations to America’s waterways. The new riverboat will feature lounges soaring 40 feet above the water with triple the glass of other riverboats, offering astounding views. American Song will also feature the Atrium, a four-story glass-enclosed area with a large domed skylight, which will serve as the central gathering point for the entire ship. With an exclusive capacity of just 184 guests, American Cruise Lines said the new ship has the modern design features and contemporary styling that today’s traveler has come to expect. American Cruise Lines recently announced the brand-new ship successfully passed sea trials with “flying colors” and is on its way to the Big Easy. The arrival of American Songis the latest in a series of milestones achieved by Port NOLA’s thriving cruise sector that offers passengers both riverine and ocean-going itineraries. Port NOLA set a new record in 2017 with 1,150,172 passenger movements at its Erato Street and Julia Street Cruise Terminals. The 2017 milestone marked four consecutive years of more than a million cruise passenger movements and nine years in a row of cruise passenger growth. As demand for cruising from New Orleans increases, cruise lines are responding by deploying newer and larger ships to Port NOLA. Royal Caribbean returns to New Orleans in December 2018 to homeport the Vision of the Seas, a 2,050-passenger ship. Port NOLA will welcome the largest cruise ship in both length and passenger occupancy to ever sail from New Orleans when the 3,963-passengerNorwegian Breakawayarrives in November 2018 replacing the Norwegian Pearl. Norwegian will offer guests a new cruise experience again the following year when the 3,963-passenger Norwegian Getawayrepositions in the Crescent City replacing the Norwegian Breakaway in 2019. Carnival Cruise Line will increase capacity on its short cruise program in 2019 by replacing the Carnival Triumphwith the Carnival Valor, a 2,974-passenger ship. Carnival will offer guests a new cruise experience in 2019 when the Carnival Glorytakes over the 7-day itinerary of the Carnival Dream.